Price reduced on this beautiful used 42' Boston Whaler for sale! : Atlantic Yacht & Ship, Inc.
Price reduced on this beautiful used 42′ Boston Whaler for sale! Announcing a price reduction on this beautiful used 42′ Boston Whaler boat for sale with Stephen Faraldo! In the first place, this used 42′ Boston Whaler was launched in 2017. Overall this is a great opportunity to purchase a like-new used 42′ Boston Whaler at a discounted price. 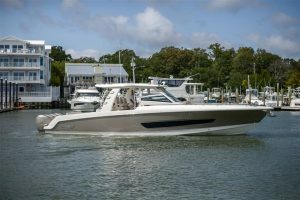 As can be seen the boat shows like-new and is loaded with options! One immediately notices that this used 42′ Boston Whaler has helm seating that accommodates six. Furthermore, this seating is easily converted to face aft. You will love how the cockpit sun shade deploys electronically. Electric heads include a VacuFlush toilet along with an enclosed shower. The shower even has a rain shower head! There is seven feet of headroom in the spacious V-Berth cabin. The whole thing is powered by quadruple Mercury Verado 350 hp engines. Additionally, with joystick control you will handle this boat with ease. If fact, this used 42′ Boston Whaler has the new Mercury SmartCraft Vessel View Displays. On the whole this boat has dynamic running surface hull technology. Similarly, that means you get features like automatically adjusting trim tabs. For more information on this beautiful used 42′ Boston Whaler be sure to contact Stephen Faraldo today! Price reduced on this beautiful used 39′ Meridian yacht for sale! Price reduced on this beautiful used 42′ Sabre boat for sale!